Michael Gunn shows his school spirit in the school’s gymnasium. 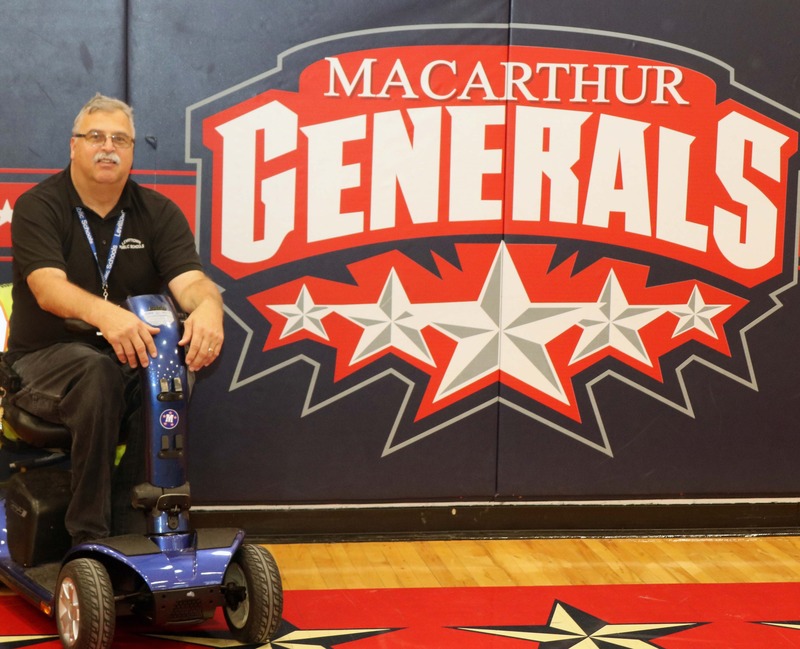 LEVITTOWN — Michael Gunn, head custodian at Levittown School District’s General Douglas MacArthur High School, has been exceeding expectations for the 40 years he has been employed by the district. His incredible professionalism and exemplary work is why Gunn was honored with this year’s Excelsior Award. The Excelsior Award, co-sponsored by CSEA and the New York State Public High School Athletic Association (NYSPHSAA), honors a CSEA member in a NYSPHSAA school who has helped promote and foster athletic success in their school district. Gunn began working in the district as a cleaner while he was still in high school. After graduation, he got a job in the school district as a part-time cleaner. He worked at a few local schools until finally settling at the high school 26 years ago. 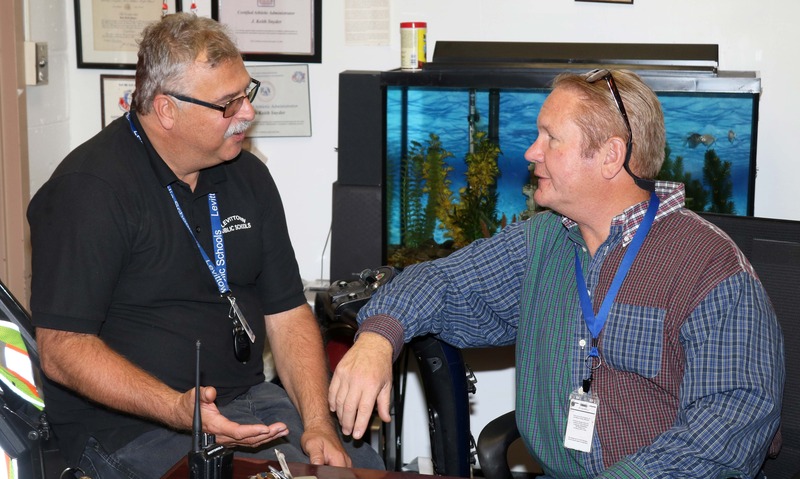 Gunn’s current job responsibilities include making sure the school is safe for staff and students, supervising the custodial crew and lending a helping hand wherever needed. School principal Joseph Sheehan makes it clear that MacArthur High School would not be where it is today without Gunn. “He’s the consummate team player who has no problem getting his hands dirty when needed and he does it because of the tremendous pride he takes in the success of this building,” said Sheehan. Although Gunn was diagnosed with cerebral palsy at birth and has mostly used a scooter to get around for the past few years, Gunn does not let his physical limitations hinder him in any way. 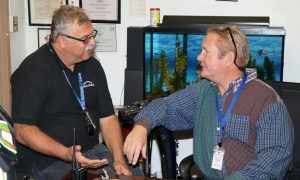 Michael Gunn and Levittown School Distric District Director of Athletics Keith Snyder discuss future plans for the school’s athletic program. Keith Snyder, director of athletics at the Levittown School District who nominated Gunn for the Excelsior Award, remembers when he first witnessed Gunn’s tenacity. “All of our jaws were on the floor; there were kids on the football field crying because of what they just saw,” said Snyder. Gunn’s passion for his work obviously hasn’t been lost on students. A bit overwhelmed by the high praise he’s receiving because of his award, Gunn refers to himself as a, “behind the scenes guy” who wouldn’t be successful without his work family. “Working for the administration and working with my colleagues is like having an extended family,” said Gunn.